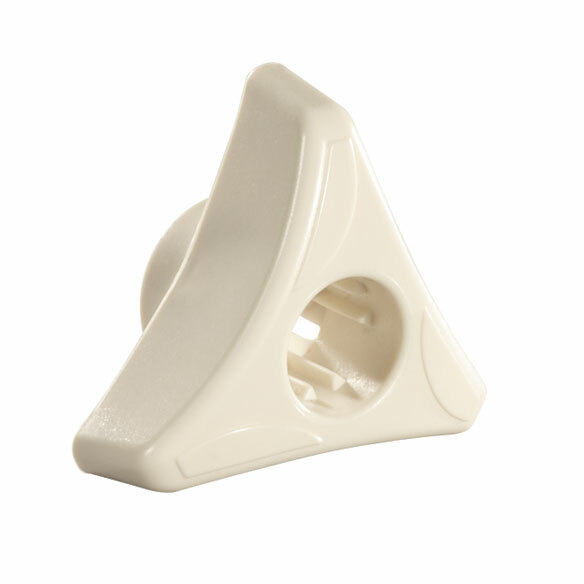 Triangular lamp switch turners fit over lamp knobs to provide a slip-free grip. 1 1/2" W. Set of 2 lamp switch knobs. It's very easy to use. it doesn't take much effort to use.Sometimes you barely touch it and it still works. This product really makes it easy to get the lamps turned on and off. Should come standard with all lamps! I've been struggling with my lamp for at least 6 months. I thought it was the lamp! Well to find out, it's me. Because of arthritis I've lost strength in my hands. I'm on the lookout for any products that can help me turn things or open. Very happy. We have light. I ordered for my living room lamps I'm able to turn them on each day without asking for help. The lamp switch turners are great!! I don't have to fumble around trying to find the switch anymore. I got white because it matches my lamps better and I have found that the turners are very easy to see. Just what we needed.. Need to order more!! Do do not want ever to be without them again. knobs were hard to turn but these are so easy for both of us. I am going to get some more for other lamps. Mom's 82 and these really made turning on the lamps easier for her. A perfect product for arthritic fingers. No more pain turning lamps on. Best idea they ever came up with,I have arthritis and this. I have arthritis and this makes turning on our lamps so very easy for me! I love this! When you have arthritis in your hands it works wonders. Use its on table lamps I ordered 2 sets l like them wonderful. 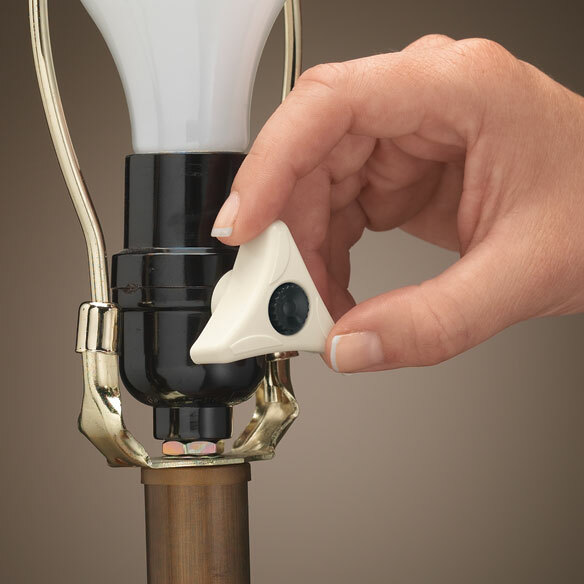 This Aid is a wonderful help in turning lamps on and off. Prior to obtaining this item it was a continual struggle to turn, on and off our living room lamp. Since installing this gadget it is now a breeze. Thanks Easy Comfort for offering this amazing, yet in expensive, Aid. This Aid is a real winner. I'd recommend it to anyone. Yes they are longer than I would have liked but it still screwed on & they are a BLESSING-So easy to turn. That is why 4 stars not 5. Now I will try more of helpful items to ease the stiffness etc. Thanks-I did see where someone put them on Backwards & Still worked-must try this too. They do not show under my shades-Love These...Thanks! I really like these. Ordered 2 pair. Although some reviews mentioned that these didn't fit their lamps, I took a chance and ordered them. Well, they didn't fit when applied as directed. After looking closely, I decided to put them on backwards and THEY WORKED!! So, if you have these in a drawer, take them out and put them on backwards and they may work! I love them since they now work. Good luck! Easier to turn lamps on. Might need help to apply. Dont know yet...its for Christmas. I bought these as a Christmas gift for my elderly mom. She has arthritis and I think these will be easy for her to use. If opening was only a little smaller or adjustable. Most of lamp switchs today are smaller then before, so these only spin around on switch making them unusable. these are a great idea but they were too big for every lamp I tried to use. As I said, I tried it backwards when I could not get it to work normally. It lasted maybe 8 days and then didn't. Very disappointed as I really needed it as I cannot turn on the lamp, don't have enough strength in my fingers. they were too small to fit the switch. of the lamp! THEY ARE NOT ABLE. THE HOLE IS TOO LARGE. Waste of money. Don't fit any of my lamps. Don't fit switches on lamps. Useless. THESE WERE RELLY HARD TO GET ON AND THEN THEY WEREN'T TIGHT ENOUGH TO TURN THE SWITCH. We could not fit them on any of our lamp knobs. I couldn't use this because it won't fit my lamp. Easy to reach and use. I need something to make it easier to turn my lamp on and off. Hopefully will help with some lamps. I am having huge trouble turning knobs and such. Hopefully, these will help. I have a lamp that has a very small knob on which the ridges have worn over the years. I'm hopping it will make easier to torn on. I've purchased these in the past and now have another lamp that needs one. This makes a knob that is almost impossible for my fingers to turn into one that is as easy as pie. I have one and the other wore out. Need more for my husband. Hard to turn off 2 lamps. Arthritic hands & fingers: this should help. My fingertips hurt every time I try to turn on our table lamp. I hope this helps. I got it so it would be easier for my Dad to be able to turn on a lamp. My hands don't have the strength no more. When light switches are small it's easier to turn lights on.. I have neuropathy in my fingertips, so my fingertips are numb. It makes it very difficult to grasp the light switch. These should make it much easier for me to turn the light on and off. My mother-in-law has severe arthritus in her hands and this will make operating the lamps much easier. I have Arthrites in my hands and I have a lamp that's hard to turn on and off. My lamp is very hard to turn and this will help tremendously. I have trouble turning on my lamp. I have a problem turning off the lamps. Have RA, Need the assistance. Already have one and it works wonderfully. To help me twist the switch on. My Mom has trouble with that. I have a lamp without the original knob. I have to use wall switch to operate it. Have one and I needed at least three more. I have some I purchased a few years ago. They ease the pain in my thumb. Needed more. What is the inside diameter of the Lamp Switch Knobs? It says they are 1 1/2 " wide, but not the diameter of the hole that actually slides over the existing lamp switch. Thanks. BEST ANSWER: Thank you for your question. The opening is 7/16" inch. We hope this information will be of help to you. I measure 1/2 " hope this helps. Need ones for the very small knobs. Lamp switch knobs.???? BEST ANSWER: No these won't fit for very small knobs. They are more for lamps that have a large to extra-large knob & there's no way to adapt them to fit. We ended up having to purchase a new light socket with a new switch & ended up giving them to a thrift store. They should fit your small appliance as they were to small for my regular sized lamp. These knobs made turning on and the lamps much more difficult!!!! yes, very helpful for those with limited movement. will the inside ring fit all size knobs ? BEST ANSWER: Thank you for your question. The Lamp Switch Knobs will fit standard knobs on lamps. We hope this information will be of help to you. NO! It only fits lamps with large knobs. It will not fit any of my several lamps.